What is an Anti-Estrogen Supplement ? 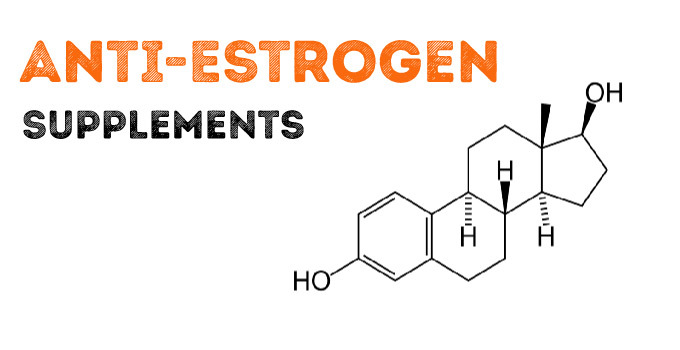 What are the ingredients in Anti-Estrogen Supplements ? What dosage should I take for an Anti-Estrogen Supplement ? Anti-Estrogen Supplements are especially designed to control your estrogen level. There are two categories of Anti-Estrogen : some anti-estrogen reduces the estrogen level and some inhibits the effects of estrogen (while keeping his level high). Anti-Estrogen Supplements can be used during and after a cycle of prohormone. The most common way to use an Anti-Estrogen, this is while doing an OTC PCT. In combinaison with a regular testosterone boosters (not containing already an anti-estrogen ingredient), it will control your estrogen level so you don’t lose your gains and have no problems regarding the gyno (gynecomastia). You can also directly use an Anti-Estrogen in your cycle of prohormone. The benefits of doing this action are multiple : you will get dry lean gains, it will increase more your testosterone levels and you will have a better control of your estrogen so your body is more prepared for the PCT. Few times ago, there were 2 compounds on the market mainly used in Anti-Estrogen Supplements. First one was ATD (1,4,6 Androstatriene-Dione) -now banned- was the cheapest and best anti-estrogen on the market. Second one was 6-oxo (4-Androstene-3,6,17-trione) also called 4-AT, more expensive than ATD but still good. Both ingredients are now banned. Then manufacturers brought two new compounds : 6-bromo (androst 1,4-diene 3,17 dione) and Androst-3,5-dien-7,17-dione (Comparable to ATD). Both ingredients are very potent and Androst-3,5-dien-7,17-dione is often compared to chemical aromatase inhibitors (very potent anti-estrogen products). There is no specific dosage for the Anti-Estrogen Supplements. Just follow the guidelines from the manufacturer. Where to buy Arimistane ? Where to buy Inhibit-E ? Where to buy Elim1nate ? Where to buy Form-XT ? Where to buy E-Control Rx 2.0 ?